The Maypop is a “tropical” fruit that can be grown in much of the U.S.
Fruit is about the size of a chicken egg – the dents mean it’s ripe! 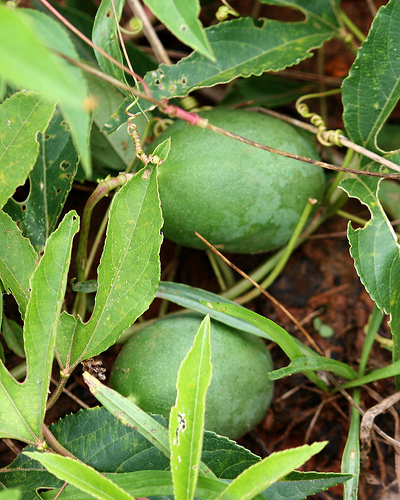 Maypops are one of the most cold hardy of all Passionfruit species. This herbaceous vine is vigorous, produces stunning flowers, and has a tropical tasting fruit… yet it can be grown throughout most of the U.S. 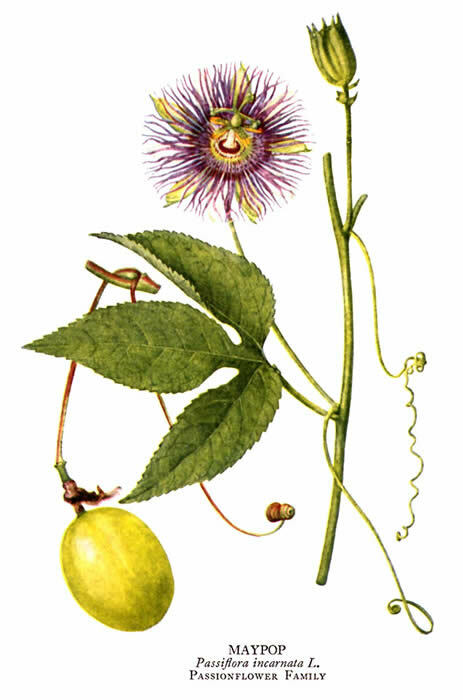 The 2-3 inch (5-7.5 cm) fruit has a size and taste very similar to its close cousin, Passion Fruit. 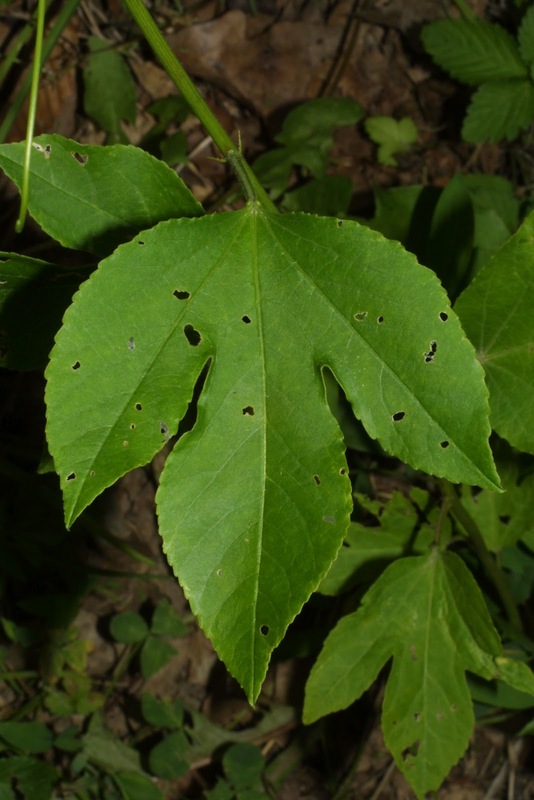 A native to eastern North America and a food source for Native Americans as well as European settlers. Very little agricultural improvement has been conducted with this plant, and it is often found growing wild today. The Maypop has beautiful flowers! The Cherokee in Tennessee named it ocoee, and the Tennessee Ocoee River and Ocoee Valley are named after this flower. 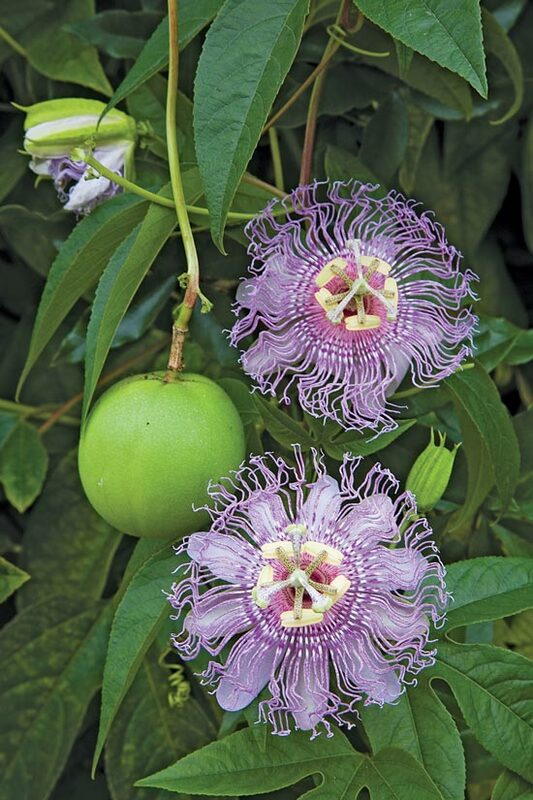 The Maypop is the State Wildflower of Tennessee. While this plant does have perfect flowers (contains both male and female parts), many of the flowers are functionally male – the female parts have atrophied or grow in a way that will never allow fertilization. This means that not all flowers will set fruit. 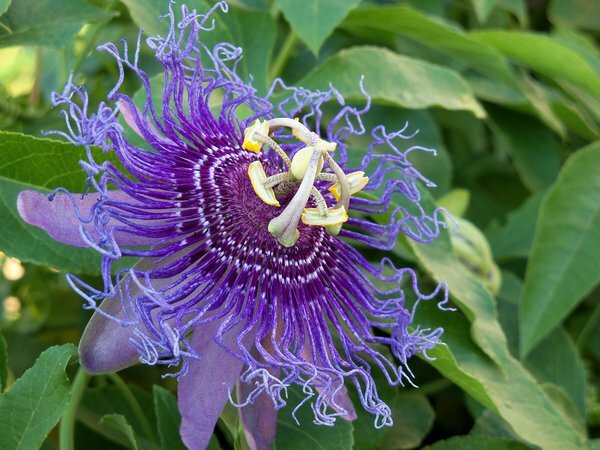 The Maypop will change the number of female flowers it produces throughout the growing season based on the growing conditions. 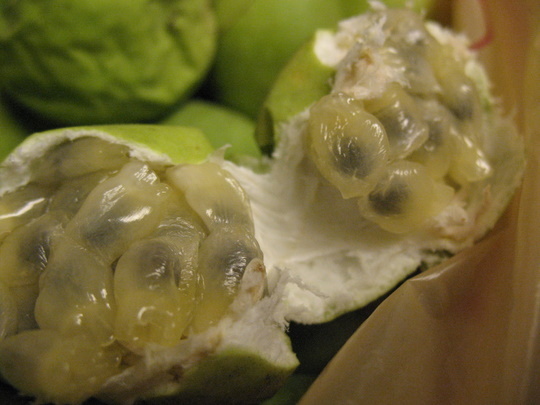 The Maypop’s name has been reported to have two meanings: 1) it “pops” up in May rather quickly, 2) while it shoots up in May, the ripe fruit that drops can make a loud “popping” sound if you accidentally step on them. The odd packaging of the flavorful fruit… technically a berry. 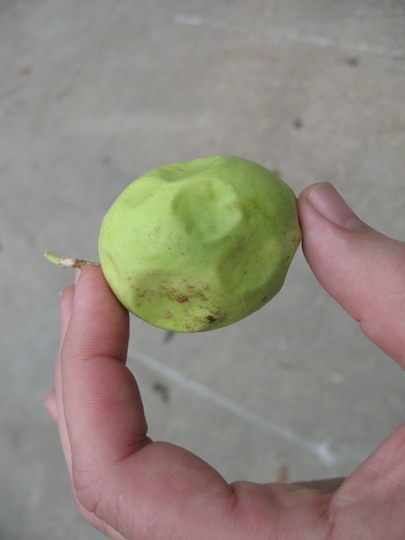 Wild Maypop fruit can be hard to find. Harvesting: Late Summer – Autumn (September – November). Fruit ripens through the season, so plan to check the vine often. Many growers will just wait for the mature fruit to drop before harvesting. Storage: Fresh fruit can store for a week or two at cool room temperature. Don’t let it dry out by placing it a dry environment. Cultivars/Varieties: There are few named varieties, most named varieties that exist have been improved for their flowers and not their fruit; hence they may not be a good choice for the Permaculturist (one named variety is even sterile!). However, there are many unnamed varieties that grow great fruit. Pollination: Needs Cross-Pollination to produce fruit – needs another variety/cultivar nearby, and both will set fruit. Pollinated largely by Carpenter Bees. If none are present, and since there are not a lot of flowers, some growers will hand-pollinate using pollen from a flower that has been open for 12 hours. Growing Maypops from seed can be a troublesome task… I’ll stick with cuttings and layering. The fruit needs a long and warm summer to ripen, so consider planting in your sunnier spots. This plant starts late in the Spring (remember the name? ), so it can be planted in a place that late summer shade will not interfere with other plants growth. 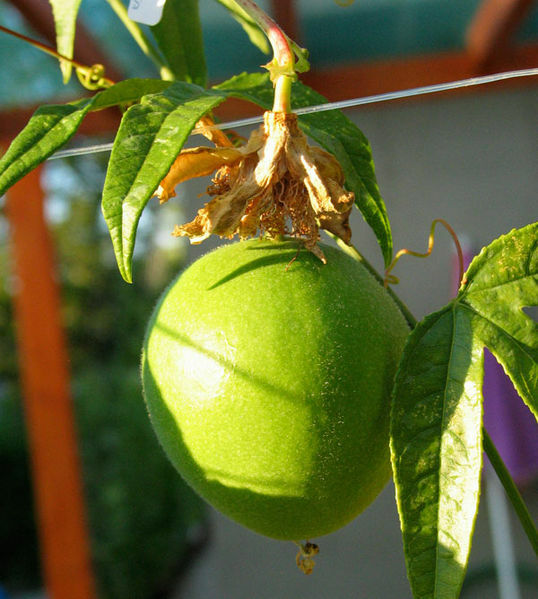 Maypop grows rapidly and grows best when it can climb on a trellis, a fence, an arbor, or even other shrubs. Propagation: Layering – Take advantage of its stoloniferous nature and layer this plant in Spring and Summer… the stems root easily. Cuttings. 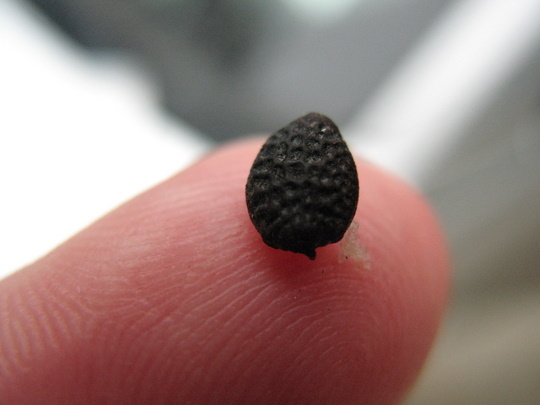 Seed – should be soaked for 12 hrs in warm water before sown; may take a full 12 months to germinate. Keep the vine in check by hand picking suckers or mowing around the plant where you don’t want it to spread. The browned vines can be trimmed back at the end of each season.